Children at HoPE Center are taught to share and teach others what they learn. In this manner they can help many people to improve many aspects of their lifestyles. 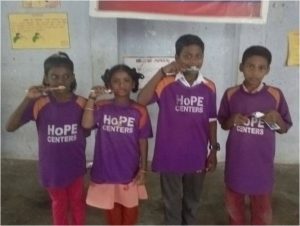 They did exceptionally well in this task by passing on tips to villagers of all ages about health and cleanliness after learning valuable lessons through HoPE Learning Center’s Personal Transformation Program (PTP). Many HoPE Center children live in unhygienic conditions and lack knowledge about health and cleanliness. When HoPE teachers visited their homes they saw the terrible condition that they were living in. Therefore the children were asked to teach their families and friends about hygiene and health. With encouragement by teachers and older students, new students have been radically improving conditions of their homes and communities. Planting trees around their homes to increase shade and fresh air. HoPE Learning Centers not only provide education to children in need, they also provide desperately needed services, education and support to the communities they serve. Please consider pledging a regular monthly donation to HoPE Learning Centers today.